NCAA Champions & #1 ranked OSU men’s golf won the 2019 Cabo Collegiate, shooting a historical low score of 32-under (277,269,274 / 820) during the three-day, 54-hole stroke play tournament. OSU shattered their own former record of 29-under during their first win at Querencia Golf Club in 2017. This third consecutive victory in the Cabo Collegiate is a first for any team since our event began in 2010. OSU was lead by Austin Eckroat, who carded a 3rd round 67 to complete the tournament with a score of 14-under (199), finishing two shots clear of fellow sophomore teammate, Matthew Wolff. Eckroat began his route to earning Medalist honors during the second round when he fired a 63 to move to the top of the leaderboard to start the final round. Wolff shot a bogey-free final round, which included five birdies and an eagle on Querencia Golf Club’s 15th hole, to offer an exciting chase between these two roommates and friends. Fellow Cowboy Hayden Wood finished 5-under, 6th place in the field. Senior Zach Bauchou finished inside the Top 20 at 15th. Arizona State University took 2nd place in Cabo, shooting a 24-under 828 (269, 287, 272) over the three days. Junior Chun An Yu finished 3rd in the field at 11-under 202 (66,71,65) three shots behind winner Austin Eckroat of OSU. 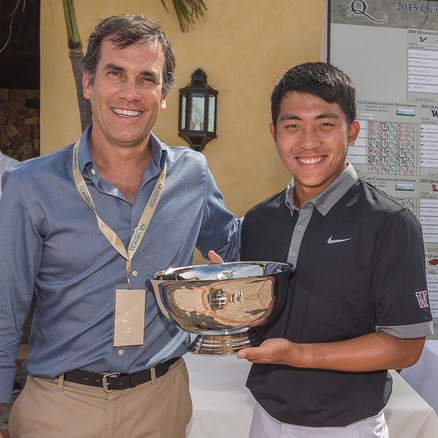 Yu kept the excitement going in the final round, where the chase for Medalist honors between Eckroat, Wolff and Yu proved why the Cabo Collegiate is one of college golf’s elite tournaments. Four Sun Devils finished in the Top 10: T3 Chun An Yu, T7 Alex del Rey, T10 Blake Wagoner, T10 Mason Andersen. Baylor University finished 3rd place with a 9-under score overall (278, 277, 288 / 843). The Bears were led by junior Colin Kober, who posted his career-best 5th place finish at Querencia. Rounding out the Top 10 were (4th) Vanderbilt University, (5th) University of Arizona, (6th) LSU / Louisiana State Univeristy, (7th) University of Mississippi /Ole Miss, (8th) Florida State University, (9th) University of Houston, and (10th) University of Arkansas. Also competing were Rice University, Texas A&M and the University of Alabama. 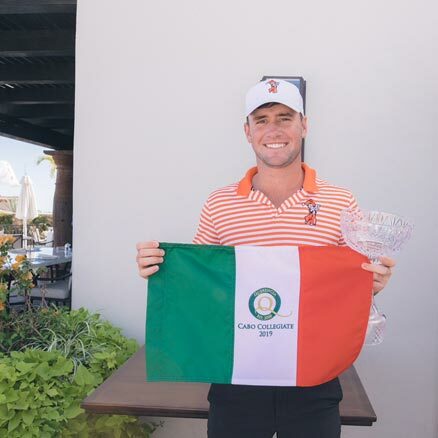 Oklahoma State University sophomore Austin Eckroat won the 2019 Cabo Collegiate at Querencia shooting a 14-under 199. Eckroat shot to the top of the leaderboard in Round 2 after shooting the tournament’s single round low score of 63. He followed up during the final round with a 67, where he carded 5 birdies on the back nine, and claimed the trophy ahead of fellow Cowboy Matthew Wolff who finished 2nd at 12-under 201. Chun An Yu of Arizona State University finished 3rd at 11-under, Trevor Werbylo of Arizona finished 4th at 8-under and Baylor’s Colin Kober finished 5th at 6-under. Rounding out the Top 10 were: 5th Hayden Wood of OSU (-5); T7 Alex del Rey of ASU, John Pak of FSU, and Luis Gagne of LSU (-4); T10 Blake Wagoner of ASU, Beau Briggs of Ole Miss, and Mason Andersen of ASU (-3). Please visit golfstat.com for all results of the Querencia Cabo Collegiate. The Oklahoma State University Cowboys fired a 4-under 280 in the third round of the 2018 Cabo Collegiate, to retain their status as “reigning Champs”. Matthew Wolff led the third day for OSU, firing a 4-under 67, which included a bogey-free back nine. Wolff also led the Cowboys and the field during Round 1 with a 6-under 65. OSU’s 54-hole total of 14-under (838 / 276,282,280) ensured the 8-shot victory over the University of California. The 13th-ranked Cal Bears began the final round only one shot behind OSU, and battled them shot-for-shot through the first nine holes, ending the tournament with a team total 6-under (846 / 281,278,287). Junior Collin Morikawa led the Bears, earning Medalist honors in the elite field. The 17th ranked University of Texas Longhorns finished 6-over par as a team (858 / 286,285,287), placing 3rd in the stacked field. Senior Doug Ghim led the Longhorns each round, shooting at-or under-par all three days, to finish 6th in the field. The Arizona State Sun Devils finished 4th at +7 (859 / 285,279, 295), followed by Duke University at 8-over par, 860 (289,288,283). Rounding out the Top 10 were T6 University of Arkansas (862 / 296,282,284); T6 University of South Florida (862 / 293, 291, 278); 8th Vanderbilt University (865 / 296, 286, 283); 9th Florida State University (869 / 287, 285, 297); and 10th Baylor University (871 / 299, 281, 291). Rounding out the field were Stanford University, University of Mississippi, Rice University, University of Houston, and Wake Forest University. Collin Morikawa took control of the golf course and the record books, winning Medalist honors with a 3-day score of 16-under. His total 197 over three days broke the previous Cabo Collegiate Individual 54-hole low score of 9-under. Morikawa also broke Cal’s 54-hole program record after shooting 66, 67, 64 in rounds 1,2, and 3, respectively. "It feels awesome", said Morikawa after the victory. "This is one of the strongest tournaments of the year and to play well all week made this trip very special." Matthew Wolff of Oklahoma State was 3 strokes back, at 13-under (200 / 65,68,67). Three student-athletes shot 4-under (209) to tie for 3rd place: Alvaro Ortiz of Arkansas (72,69,68), Viktor Hovland of OSU (68,69,72), and Theo Humphrey of Vanderbilt (68,68,73). Other top finishers were Doug Ghim of Texas (210); Mason Andersen of Arizona State (211); Jon Pak of Florida State (211); Jamie Li of Florida State (212); Patrick Martin of Vanderbilt and Garrett May of Baylor rounded out the Top 10 with a 54-hole score of 213 each. The Oklahoma State University Cowboys won the three-day 54-hole QCC Championship with a total team score of 823, shooting 29-under. The Pokes were led by Zach Bauchou (68,71,66) and Kristoffer Ventura (69,67,69) who both finished T2 (205) at -8. This was the third victory for the Cowboys, and it was a special one competing against one of the toughest fields in all of college golf. The OSU Cowboys and the Texas Longhorns, both new to the QCC in 2017, each shot a team score of 273 to open the tournament in R1. On day two, OSU fired a 279, one stroke better than Vanderbilt for the day, and never looked back. Three Cowboys finished inside the Top 10 individually. The Baylor University Bears finished 2nd in Cabo, making this the third time in the past 4 years they have placed inside the Top 3 in Mexico. Leading the Bears was Garrett May, who shot a 5-under 66 in Round 3 to finish T2 Individually. Wake Forest University (T3) and University of Washington (T3) each shot 845 over three days to share 3rd place honors in the stacked field. The University of Texas rounded out the Top 5 in their first appearance in Cabo. Vanderbilt University, University of South Florida, Duke University, University of Arkansas and Florida State University rounded out the Top 10, 6th - 10th place. Also competing were (in order of finish) University of Houston, University of Mississippi, defending Champs University of Georgia, University of California, and Rice University. Corey Periera of the University of Washington was named the 2017 Medalist after a par on hole #18 put him one stroke below 4 student-athletes, finishing the tournament with a -9, 204 (70, 67, 67). This was Periera's fourth collegiate win, and first honor in Cabo. His former teammate, C.T. Pan, won Medalist honors in 2015. The Huskies and the Razorbacks are the only two teams in QCC history to have two program medalists in Cabo. Four fellow competitors were chasing Periera in the final round, and share runner-up status: Bachou (68,71,66) & Ventura (69,67,69) of OK State, May (67,72,66) of Baylor, and Cristian DiMarco (67,70,68) of the University of South Florida. This was the first appearance at Querencia Golf Club for Bachou, Ventura, and May. Rounding out the Top 10 in order of finish were Hayden Wood of OK State, Will Zalatoris of Wake Forest, Collin Morikawa of Cal, Chandler Eaton of Duke, and Matthew Perrine of Baylor. The University of Georgia Bulldogs took top honors in a tough field, scoring 18-under over three rounds (834). This impressive victory was virtually assured after a QCC tournament record-setting single round of 16-under on day two, during which Georgia Senior Sepp Straka led the day for the Bulldogs with a score of 65. Four Bulldogs shot 68 or better during the second round. After winning the QCC, Georgia immediately moved all the way up to #2 in the Golfstat NCAA team rankings. The University of South Florida (USF) Bulls captured 2nd place with a three-day total score of 8-under (844). The Bulls were in contention each round, finishing 1st after R1 and 2nd after R2. USF Senior Aksel Olsen of Norway earned Medalist honors by topping the leaderboard at 9-under (68, 67, 69). Baylor University finished 3rd at 5-under (847). The Baylor Bears led the tournament with 58 birdies across the three rounds. Braden Bailey fired the R3 low score with a 66. Houston (+28), Oregon State (+28), Wake Forest (+33), and Rice (+42). Taylor Moore of the University of Arkansas, Lee McCoy of the University of Georgia, and Collin Morikawa of the University of California shared Second Place Individual honors, each posting a tournament score of 8-under 205. Moore of Arkansas carded two eagles during the three rounds of competition, while 11 additional student-athletes recorded one eagle on their scorecard during the tournament. Nathan Jeansonne of LSU aced hole #14 in Round 3. The 5th annual Querencia Cabo Collegiate (QCC) has concluded and we have a new champion – Congratulations to #2 ranked Florida State University, who shot an impressive 7 under in the final round to take the title at thirteen under for the three day event. Rowin Caron and Hank Lebioda posted 67's in the third round, and both finished the tournament in the top five. The Seminoles were one of just four teams to finish the tournament under par, and the only squad to have two players with top five finishes. "Today's team round is one of the better rounds we have played this year. This was a hard course with a great field"
Vanderbilt University fired an impressive eleven under on the final day to take 2nd place. The University of South Florida earned 3rd place honors with a four under. The University of Washington (-2) and Stanford University (+2) rounded out the Top Five. Cheng-Tsung Pan of the University of Washington, the #1 ranked collegiate player, took Medalist honors with a nine under 204. Pan fired a 2-under 69 in the final round to finish as the only player in the field with three rounds in the 60's. The QCC victory marked Pan's 6th win as a Husky. "It's amazing to watch his level of excellence day in and day out. He's so steady and so consistent and has had a huge impact on our program"
Pan finished one stroke clear of Rowin Caron of Florida State, who placed 2nd at eight under for the tournament. Kyle Jones of Baylor University shot a 4-under 67 in the final round to take 3rd place. Arkansas (+17) and Kentucky (+17) rounded out the Top Ten. Also in the field were Wake Forest University, Ole Miss, Rice University and Lamar University. The Querencia Cabo Collegiate congratulates our 2014 champions, the University of Houston. The 11th ranked University of Houston Cougars swept both the team and Individual titles at Querencia in the 4th annual QCC. Roman Robledo (Junior) finished 4-under-par, after leading every round. Robledo's score of 209 was one stroke better than 2nd place Individual Kyle Jones of Baylor University, and two strokes in front of Alabama's Robby Shelton who was ranked #4. This trio was the only group to finish par or better. Houston posted a team score of 863 to finish one stroke ahead of #1 ranked and defending national champion Alabama (864). Baylor University finished 3rd with a score of 870. "This has been a great week for us. Our guys played hard on a very demanding course. Anytime you are in competition with the No. 1 team in the country, you better play at your best, and our guys did just that"
The top-50 ranked teams finishing behind Houston, Alabama, and Baylor were #32 Kentucky (870), #16 Vanderbilt (875), #29 SMU (875), #17 Arkansas (882), #31 LSU (883). Chattanooga, Mississippi, Lamar, Coastal Carolina, Arlington, and Abilene Christian rounded out the field. to promote and support amateur golf at the collegiate level. The University of Arkansas & Santa Clara University served as co-hosts for the first annual tournament, welcoming a field of 12 teams, which included the University of Houston, Southern Methodist University, Lamar University, UT-Arlington and Oregon State University. The Arkansas Razorbacks took the Championship with a score of 854 over three days (297-280-277). 2nd place was awarded to Houston, with a three day total of 876 (293-292-291). Oregon State placed 3rd with 877 (297-296-284). Arkansas was also victorious in Individual honors led by Jamie Marshall who shot a 211 (74-69-68). Fellow Razorback Austin Cook (72-72-68) tied for 2nd with two other competitors who each shot 212: Kelly Kraft of SMU (72-65-75) and Jerry He of UC-Irvine (73-71-68). The 2nd annual QCC was held in October, 2011. Due to course conditions, tournament play was held at the Campestre Golf Club, and hosted by the University of Arkansas and Santa Clara University. The Razorbacks retained their Championship title, with a three day score of 831 (-21). Southeastern Louisiana placed 2nd with a score of 857 (+5), followed by Saint Mary's (CA), finishing 3rd with a score of 859 (+7). Arkansas Razorback Sebastian Cappelen was the Individual Champion with an eight-under-par 205 (68-68-69). Fellow Razorback Austin Cook was awarded 2nd place with a six-under-par 207 (71,69,67). 3rd place honors went to Danny Keddie of Tennessee after a four-under-par 209 (71,70,68). For the 2013-14 event, Querencia elected to move the Cabo Collegiate to the college Spring season (March 2-4, 2014). Southern Methodist University (SMU) hosted a field of 14 teams, including several of the top ranked programs in the US. 2014 QCC participants: University of Alabama, University of Arkansas, Abilene Christian University, Baylor University, Coastal Carolina University, University of Houston, University of Kentucky, Lamar University, Louisiana State University, University of Mississippi, University of Tennessee-Chattanooga, University of Texas-Arlington, and Vanderbilt University.